Connect with sports, STEM, and the arts at the JCC Day Camps based on the Karl Community Campus in Whitefish Bay. Many camps travel throughout the Milwaukee area creating unique experiences for our campers. All JCC day camps offer extended care to fit the schedules of busy families for an additional fee. Milwaukee Bucks Basketball, Milwaukee Wave Soccer, Golf, Dance Team, and more. Theater, Cooking, and Art camps will keep the creative juices flowing this summer. 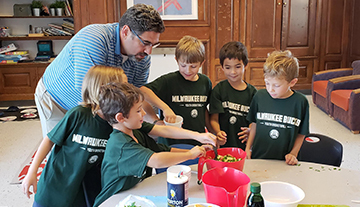 Explore rockets, water, and the city of Milwaukee with these camps. Questions about specailty day camps? 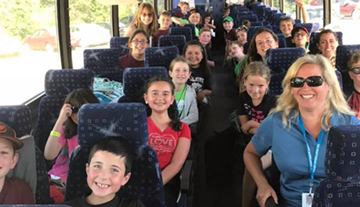 Contact Jess Lanke, JCC Specialty Day Camp Director, at 414-967-8194. Summer, fall, winter spring… the JCC has programs for kids of all ages and abilities. When your child is ready for sleep-away, come home to Camp Interlaken. Keep that camp feeling all year long at Kids Center Before & After School. Camp is more fun when everyone can participate. Scholarships make that possible.